By welding the European aerospace industry into a cohesive force and directing the pace of technological change in civil air transport, Airbus Industrie has successfully challenged the competition and now ranks as one fo the world's largest commercial jetliner manufacturers. 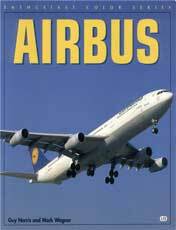 The book traces the history of Airbus and its head-to-head match with Boeing. Each Airbus model is covered. 96 pgs, SB, 8.25 x 9, dozens of color photos.